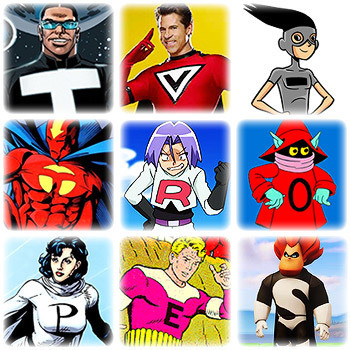 In order: Mister Terrific, Major Victory, The Hyphen (from a grammar website ), Red Tornado, Kojiro / James (from Team Rocket), Orko, Phantom Girl, Element Lad, and Syndrome. Kari: What does the 'S' stand for? Superheroes are in many ways much like athletes. Both frequently perform amazing physical feats we envy; both often collect themselves into teams with fancy names; both wear colorful, form-fitting uniforms. And both have a tendency to adorn those uniforms with single letters of the alphabet. Stumped for a Chest Insignia? Just style up the first letter of your Code Name in sufficiently distinctive typeface, and have at it! It doesn't even have to be the first letter. It can be just your favorite letter, or it could be your full name! The M&Ms are distinguished by their "m" markings. This has been used a few times in reference to how an M&M isn't one without their "m". Ichi of Ichi the Killer wears a big "1" on his back, since his name means "one" in Japanese. Similarly, Ah! My Goddess's Keiichi, when he took part in the drag bike race, wore a jacket with "K-1" on the back. In the manga, he frequently signs his notes that way, as shorthand. Mazinger Z: Although the original series avoided this, in later retellings and spin-offs Mazinger-Z wore a big "Z" letter in such the chest, the Hover Pilder or the Jet Scrander. It's a plot point for Mazinkaiser. When the jewel on Mazinkaiser's chest displays a Z, it means Kouji Kabuto is in control. When it turns into the kanji 魔 (Ma, meaning demon), Kaiser goes berserk. It also possesses a never-seen Super Mode when the symbol becomes the kanji 神 (Jin, meaning god). The big red R for Rocket of Team Rocket, general bad guys of the Pokémon series. Team Rocket had a form of Lampshade Hanging of this in an episode. They set up a fake Pokemon Center by covering part of the letter 'R' painted on the wall with a piece of paper, making it look like the 'P' associated with Pokemon Centers. Eventually, Team Rocket's logo itself would be stylized in the anime, from the Best Wishes series onwards. The previous big R logo is still used, though, most notably on the grunts' uniforms. Science Ninja Team Gatchaman: Gatchaman team members wear a large, red "G" on their belts. When it was dubbed in English as Battle of the Planets, the team was simply called G-Force. Gai Shishioh from GaoGaiGar wears a large "G" on the right side of his chest. "G" is for the entire Gutsy Galaxy Guard. "J", likewise, is for the J-Ark Fleet, manned by Soldat J cyborgs. In both cases, the letter appears inside their Power Crystals (the G-Stone and the J-Jewel) when they get a powerup. "G" is for... Speed Racer, because his name in the original anime is Go Mifune (he also wears an "M" on his helmet to represent Mifune Racing). His girlfriend Trixie has an "M" on her blouse, for Michi Shimura. The mechanic Sparky has an "S" on his shirt, which stands for...Sabu. The late 80's comic version of Speed Racer by NOW Comics claimed that the "G" stood for Greg, which was Speed's real name in the comic (making him Greg Racer). Chargeman Ken! has a large letter "K" on his orange sweater. Bleach's Ichigo Kurosaki has a 15 on his room's door. It becomes kind of a pun if you realize "Ichi" is 1 and "Go" is 5. Plus he's 15. His sister refers to him as 'Ichi-nii', which, while short for 'Ichigo-niisan' (big brother Ichigo), is also similar-sounding to ichi-ni, which translates as "1-2". Ichi-niisan itself sounds a lot like ichi-ni-san, which is "1-2-3". Luffy wears a '01' because he is captain or a '56' which reads 'go-mu'. Dr. Minami in Heroman has an M on his shirt. Wonder why. In Future GPX Cyber Formula, all the cars have numbers throughout the series. The "S" in later Asurada models stands for "Sugo", the racing team the main character, Hayato is in. Shoemacher/Osamu in 11, also has the letter "S" in his racing suit. And Kaga's racing suit has the letter "Z" in it, as he belonged to Aoi ZIP formula. Some of the team logos also has letters in it, like the "S" for Sugo and "Z" for Aoi ZIP. "A" is for Action Kamen, though it's on his belt only. The Spanish dub completely ignored it and called him "Ultrahéroe". The Robot Masters created by Dr. Light and Dr. Wily in Mega Man Megamix have their creator's letter on them. Notably, the Robot Masters made by Dr. Light (Dr. Right in Japan) have an R on them, even in English translations. In the final episode of Gundam Build Fighters Try, Sekai Kamiki unveils the first Gunpla he built by himself (with some help from Shia), the Kamiki Burning Gundam. Its right shoulder armor has the kanji 神, meaning "god" and possessing a double meaning: Sekai own surname, and the God Gundam, an obvious inspiration in its design. "50", as found on the back of America's jacket, stands for the 50 states, natch. This detail was removed in the anime. In her first appearance in Dragon Ball, Bulma is wearing her full name on the front of her shirt. A kanji variant shows up in Dragon Ball Z, where during the Namek Saga, Goku wears 悟 (the kanji for the syllable "Go") on his gi (which previously sported the symbols representing Master Roshi and King Kai). Aside from the Non-Serial Movie The Tree of Might, Goku goes without symbols of any kind after Namek, until the "Go" kanji returns in Battle of Gods and Dragon Ball Super. Birdman of Perman wears a shirt with a "B" on it. Headmaster Tele, the heroes' school principle in Happy Heroes, wore a costume with a big "T" on the front when he was still a superhero. "A" is for Aquaman (and Aqualad) and Animal Man. Anarky also wears this letter, though as part of the "Anarchy-is-order" Circle-A. "C" (impaled by a carrot) is for Captain Carrot. "E" is for Element Lad. Bronze Age and Retroboot Element Lad has an Interlac E.
"E" or "EM" is for the Elongated Man, depending on the costume. "F over A" is for The First American from Alan Moore's Tomorrow Stories, published by America's Best Comics, a Wild Storm imprint. "G" is for Green Arrow — some artists draw his belt buckle with a noticeable "G" shape. When his former sidekick, Speedy/Arsenal/"Red Arrow", adopted a red version of GA's costume, it included the "G"-shaped buckle at first. When the moniker "Red Arrow" became official, the belt buckle became a distinct "R". "GG" is for Guy Gardner, during the period when he was operating as a superhero (using Sinestro's yellow ring) with no codename other than his own name. "Remember when Guy used to fly around with that big G on his jacket?" "Remember what he said it stood for?" "i" is for Invisible Kid. "L" is for the Legion of Super-Heroes—many Legionnaires (in the post-Zero Hour! Reboot, all of them) have an L-logo belt buckle. The classic Legion flight ring also has an L. Un-boot Lightning Lad even has an L-logo tattoo. "LL" is for Lex Luthor. Specifically, it was the logo on Lex Luthor II's Power Armor. In Supergirl: Cosmic Adventures in the 8th Grade, Supergirl's friend Lena wears a pendant with an "L" written on it. "M" is for 'Mazing Man; it was going to be "W" for Wonderful Man but the letter broke and flipped over on the helmet he found. "MX" is for Madame Xanadu (Demon Knights version). "P" is for Phantom Girl and Pig Iron. In the New 52 universe, Power Girl's costume had a "P"-shield for a while. "R" is for Robin. The resemblance of the original "R" logo to the official "registered trademark" symbol is uncanny, and has been the source of some humor in the past. "S" is for Superman (and "family": Supergirl, Superboy, even Steel...). He may possibly have been the Trope Codifier, since he is such a prominent example. Bizarro uses a reversed (twisted in the DCAU) "S". Oddly enough, Superman's Jewish parody Shalomman uses the Hebrew letter shin, which is the initial letter of the word "Shalom." His bizarro-equivalent had the Hebrew letter sin, which in addition to being a shin-with-a-backwards-dot also made a pun on the word "sin." "S(blank)" is for too many homages/parodies of Superman to count. Originally the "S" obviously stood for Superman. Later, however, DC moved away from this in the comics and in film and TV adaptations. At first it became a family crest, an idea reflected in early TV and film versions. This also explained why cousin Supergirl's costume also has that symbol. In Pre-Crisis stories, such as Krypton No More, though, it was only a cool emblem. In 52 Ralph Dibny reveals that the S is actually the Kryptonian symbol for the word "hope". This was carried forward in subsequent adaptations, notably Smallville and Man of Steel. Upside-down, it means "resurrection". Superman once defeated a Proud Warrior Race Guy called Draaga in gladiatorial combat on Warworld. In the comics, Draaga wore a replica of Superman's costume, while on the Justice League cartoon he actually burned an "S" symbol onto his chest—in both cases this was so he wouldn't forget his failure. Supergirl stopped wearing the S-shield during her brief Red Lantern stint in Red Daughter of Krypton arc, but she donned the S-emblem again after taking her Red Lantern Ring off. In Superman: Brainiac, Supergirl's mother Alura wears one "S" on her belt buckle and one on the brooch that holds her toga on. "T" is for Tasmanian Devil (of the Global Guardians and Justice League Europe) and Red Tornado. Michael Holt's Mr Terrific has a T-shaped mask. Well, unless that's just facepaint. "W" (and occasionally "WW") is for Wonder Woman, when she's not using an eagle insignia. In a few continuities, like Kingdom Come, the two are combined: a stylized eagle that happens to resemble a W.
In some Latin American countries, it's an "M" or "MM" for "Mujer Maravilla". "Z" is for General Zod—at least the Polkistanian version ◊. In the Legion of Super Heroes "Z" is also for...well, the guy wearing it is named Drax, but considering Drax is a kid from the Phantom Zone, a safe guess would be "General Zod," presumably his father figure. "Ω" (Omega) is for Omega Effect, so Darkseid's modern costumes have a Greek letter Ω as a Chest Insignia. "0" is for the evil alternate reality version of Kon-El who goes by Black Zero. The Chinese character for the number "7" is for the Great Ten's Seven Deadly Brothers. "A" is for Captain America (on his head) and Apocalypse (on his belt buckle). "D" is for Demolition Man (sometimes just called "D-Man"). Two means Daredevil... though this gets a little complicated when you realize that Daredevil's original costume really did have the one "D", and is in fact the very same costume worn by D-Man (only with a Wolverine-like cowl). "F" is for Flatman, a member of the less-than-astounding Great Lakes Avengers X-Men Champions Initiative. "G" is for Galactus (on his belt buckle in his first appearance). Joked with in a behind-the-scenes comic, which claims that Galactus was originally intended by Jack Kirby to be God, the ultimate opponent for the Fantastic Four. Thankfully, Stan Lee talked him out of it. "H" is for Hawkeye. And Hardball. "I" is for Mr Immortal, the Man Who Can't Die No Matter How Much He Really Wants To, and leader of the aforementioned Great Lakes Initiative. His 'I' is in multiple places, with 'Mr.' written inside the letter itself, since it's just a big rectangle anyway. "M" was for Mandarin, in his original costume. Also Magneto, in his mid-80's outfit. "P" is for Puck (of Alpha Flight). "S" is for Sentry (on his oversized belt). "T" is for Thor (sometimes  it's on his belt buckle in the Silver Age) and, by extension, Thunderstrike. These days, Thor's belt buckle is the rune uruz (basically the letter "u"), because the Uruz rune was traditionally used to represent the god Thor. It also represents strength and virility. In addition, "u" stands for "uru", from which Mjölnir is made. "W" is for Wonder Man (when he's not using Civvie Spandex). "X" is for the X-Men's "x-factor" or "extra factor" in their mutated genes. Not a letter, but each member of the Fantastic Four goes into battle with a large "4" emblazoned somewhere on their uniform. Jughead Jones typically wears a sweater with the letter "S" on it (for Springdale). His crown is emblozened with a J. In Johnny Saturn , the Utopian, as an example, wears a stylized "U" on his chest. A variation of this would be Titanium Tom, who wears a patch on each shoulder with Ti— the symbol for titanium. The revived Darkwing Duck comic books featured many Darkwings. If they were Darkwing versions of other heroes, they'd have a 'DW' or 'D' on them (such as the Incredibles version). One exception is a result of the entry under Western Animation; one of the infinite Darkwings took over Gosalyn's identity of Quiverwing Quack. In Son o' God comics, Jesus wears spandex with a cape and a "JC" on his chest. In All Fall Down, S is for Siphon and P is for Paradigm. Scott Pilgrim plays with this in a more postmodern way, given the Mundane Fantastic setting. Also, given the numeric themes exemplified by The League of Evil Exes, numbers often appear instead of letters, with the possible exception of the letter X.
Scott himself has a t-shirt with the logo for the band The Smashing Pumpkins, which happens to be the letters S and P - Scott's initials. He also has a patch with the letter X sewn onto the shoulder of his jacket, and he explicitly says this is because he is a fan of the X-Men. During a scene in which he is increasingly afraid of Ramona's exes, he tears it off, and to differentiate himself from their numerical motifs, he wears a t-shirt with the word "zero" on it (an iconic shirt design worn by Smashing Pumpkins frontman Billy Corgan). Nemesis Gideon Gordon Graves uses, as his corporate logo, a stylized image of three Gs (also resembling an inverted Triforce because Gideon is evil). Matthew Patel wears a jacket with the Greek letter Alpha on the shoulder, because Alpha is the first letter and he is Ramona Flowers' first evil ex. Lucas Lee, the second evil ex, has the number 2 tattooed on his neck, on the side of his trailer, and on his car. His belt buckle is two Xs. Todd Ingram, Ramona's third evil ex, is often seen wearing a big number 3 on his t-shirt. After defeating the fourth evil ex, Roxy Richter, and worrying that he himself is "just another evil ex waiting to happen", Scott is seen wearing a t-shirt that says says "4 1/2" in the style of the Fantastic Four logo. "A" is for the All-American. Beautie uses a stylized "B" for her accessories. Appropriately for a fictional hero, the Crimson Cougar has a prominent double-CC logo. "F" is for the First Family. In a photo, the original Goldenglove is seen wearing a championship belt with a large "G" on it. "GG" is for the C-rate villain Glue Gun, though it's only visible on his back-mounted glue canisters. Honor Guard's logo is a large serif H with a smaller sans-serif G embedded inside. Roustabout has a large cowboy belt with a double-R branding design. Supersonic's costume has a full-torso logo that resembles a very stylized "S". Winged Victory's emblem/Transformation Trinket is a capital "V" with a pair of outswept wings. In PS238, a Batman-like hero called The Revenant wears a stylized letter "R" on his chest. Exaggerated in Empowered where many heroes and villains have their entire name on their chest. Holographic Retro of Calvin and Hobbes: The Series has an "H" on his forehead. Also, the Lightning Man has a giant "L" on his shirt. Last Child of Krypton: On the chest of Shinjis Superman costume is an S emblem. It is one of the first things Touji notices about him when Shinji saves him and his sister. Those hands belonged to a boy, a boy his own age in red and blue. The sun was behind him so that he shone, and his face was in shadow. On his chest was an emblem, like an English S, angular and stylized in a diamond-shaped red field on the expanse of his blue chest. Her tight blue shirt made her not inconsiderable curves very apparent, and the yellow and red shield emblem with the "S" inside it on her chest only served to draw the eye to that area. In Neither a Bird nor a Plane, it's Deku!, Izuku's costume proudly bears the House of El's crest on his chest. He initially panics when asked about it, but he quickly calls himself an idiot when he realizes that everyone else simply sees it as an "S". He tries to explain that it means "hope", but it still gets dismissed as a stylized "S" by his peers. and I, we came up with, um, a secret language when I was a kid! Yeah, and this symbol means Hope in that language. That we made up together. When I was a kid. Itsuka: It looks like an "S", though. Thats a sweet story and all, but Im just saying that it does look like an "S". In Amazing Fantasy, the Prowler possesses the kanji for "danger" and "risk" emblazoned along the back of her Badass Longcoat as a sign of both her Thrill Seeker tendencies and how dangerous she is. "G" is for Grabowski in Cat City. "i"  distinctly lowercase with a prominent dot  is for Mr. Incredible, and later his whole family. "EG" is for Elasti-Girl; she dropped this after the intro of the movie, for plot-explained reasons. "M" is for both Megamind and Metro Man. After Metro Man faked his death he chose to change his name to "Music Man" and pursue a career as a singer. In The Goonies, when Sloth rips off his outer shirt, he reveals a Superman shirt with a single big "S", apparently standing for "Sloth". "G" is for G-Girl, from My Super Ex-Girlfriend. G-Girl was notable for not having just one costume but (being a hip New Yorker) a whole closetful, each distinguished only by a "G" motif. Interestingly, she never explains what the G stands for. "1" in an "engraved" style similar to that on the one dollar bill for U.S. Bill of The Specials. In Superman films the Superman name always comes after the S-shield, requiring the "S" to have a different explanation. These follow what had recently been established in the comics: first as a family crest, then as a pictographic symbol from the Kryptonian alphabet meaning "hope". In the 1978 film they make it clear that the reason for the S symbol is that traditional Kryptonian garb always included a chest insignia with a family seal on it, and the seal of Jor-El's clan (a serpent coiled inside a shield) just happened to look kind of like what we think of as the letter S. Other Kryptonians wore different symbols on their formal council uniforms, representing their families. In Man of Steel, Lois asks Superman about it. Lois Lane: What's the "S" stand for? Superman: It's not an "S". On my world, it means "Hope". Lois Lane: Well, here [Earth], it's an "S". In Justice League (2017), Superman tells some children that his symbol is not an "S", it is a river. Like hope, it comes and goes, but is always there. And in the movie at least, Ron gets one with "R" on it. The eponymous letter in The Scarlet Letter. It's a red 'A', which is supposed to stand for "adulteress", but since Hester, the woman sentenced to wear it, is so helpful to the people in her community, they start to believe it stands for nicer things, such as "admirable". In Superhuman, the Flying Brick Titan has one of these. in Tales of an Mazing Girl has 'M for Amazing. Cause She's Amazing. In a subversion, while Zorro is occasionally depicted with a Z on his outfit, he usually just runs around cutting Z's into other people's clothes. "W", however, is not for Wojciehowicz. In Barney Miller, the detectives get bullet-proof vests, but Wojo doesn't want to wear his. He says it makes him feel "like some sort of supercop — like I should have a big W across here." If he feels invincible, he might forget, he says, that others around him are not. "CH" is for El Chapulín Colorado. "?" is used by the Fourth, Fifth, Sixth and Seventh Doctors, possibly related to the fact that his signature contains a question mark (though "Who" is not actually his name, except in the noncanonical Peter Cushing films). According to the Twelfth Doctor, he still wears them  on his underpants. In "The Happiness Patrol", Big Bad Helen A has large capital letter 'A's on the sleeves of her outfit. The Cybermen of "Rise of the Cybermen"/"The Age of Steel" and "The Next Doctor" feature a "C" on their chests, standing for Cybus Industries, the organization that created them. The Doctor lampshades this, saying "Lumic's turned them into a brand". The Cybermen that appear in "The Pandorica Opens" still use this design, despite being the original Mondas Cybermen, due to budget issues. In the PBS children's series The Electric Company (1971), a recurring cartoon feature, "The Adventures of Letterman", had the eponymous hero sporting a different letter on his "varsity sweater" each episode; his power was the ability to change one object into another by replacing a letter in its spelling. When his arch-enemy, the Spellbinder, fired a dart at him, Letterman replaced the 'd' with a 't', turning it into a tart, which he then ate. "Z" is used for Zubat, in Kaiketsu Zubat. "S" is for Kamen Rider Stronger, and "T" is for his sidekick Tackle. In a non-Latin example, Greek letters are used for the Riders (and Riotroopers) in Kamen Rider Faiz: Φ (Phi) for Faiz himself, Χ (Chi) for Kaixa, Δ (Delta) for Delta, O (Omicron) for Riotroopers, Ψ (Psi) for Psyga, and Ω (Omega) for Orga. In Kamen Rider Den-O, Zeronos's belt resembles different letters in his various forms: "A" for Altair, "V" for Vega, and "Z" for Zero. "G" is for the Affectionate Parody Kamen Rider G.
Kamen Rider Decade, celebrating the 10th year of the show's Heisei era, sports an "X" for 10. "X" is for Xtreme, W's Super Mode. "A" is for Accel, W's ally. His own Super Mode involves "T" for Trial. "S" is for Skull, though the "S" is on his forehead and usually hidden under his hat. "E" is for Eternal, but it's not immediately obvious since the E is sideways and serves as three horns pointing up on his helmet. The Transformation Trinkets also have this. W has a Double Driver that's W-shaped when activated. There's also a Lost Driver used by Skull, Eternal, and sometimes Double himself that's effectively half a Double Driver, and the W shape is cut in half to be an "L". Two minor Riders in Kamen Rider Gaim have kanji on their helmets: in the 15th anniversary movie, Kamen Rider Fifteen has 十五 for "fifteen" as a crest on his forehead. And in the epilogue episode, Kamen Rider Jam has his visor shaped like 邪, which is "ja" like in his name and means "evil". The Riders of Kamen Rider Drive all sport an "R" logo, but it's unrevealed what it stands for; their enemies are the ones who came up with calling them "Riders" after the fact and there's no other R-word that fits. Drive's various forms also have their own letter insignia displayed on his belt: Speed, Wild, Technique, Dead Heat, and Formula (Type Tridoron is an exception, having a color-inverted version of the regular "R"-logo instead). Kamen Rider Build has an "S"-like logo that gets used as a Chest Insignia with later powerups, but as with Drive there's nothing obvious that it could stand for. It's possible that it's not actually supposed to be an "S", it just resembles one by coincidence. All the Riders literally have "Kamen Rider" written on their faces, sharing the inscription カメン (katakana for "Kamen") on their foreheads and other places on their armor, while their visors are the word "Rider" in different scripts: Zi-O himself and Woz have katakana (ライダー) while Geiz' visor is hiragana (らいだー). When taking on the powers of previous Riders, their visors change to the name of that Rider. The Monsters of the Week are Evil Knockoffs of previous Riders, and they have the original Rider's name and year of origin printed in English (the only exception is Another Shinobi, whose name and year are written in kanji) on their bodies somewhere. Non-superhero example: In Laverne & Shirley, "L" is for Laverne DeFazio. She has a cursive "L" on every blouse, shirt and sweater she owns. This was carried over to her military uniform in the Animated Adaptation. She even allowed Lenny to have one of her stylized "L"'s to replace the missing one on his jacket, making it say "Lone Wolf" rather than "One Wolf". On the British science fiction comedy Red Dwarf, holograms, such as Rimmer, are told apart from living humans by the "H" on their foreheads. The "H" changes size, color, and font every other season. Saturday Night Live: The Ambiguously Gay Duo have G for Gary and A for Ace. Unsurprisingly, there happened to be times when they had to stand next to something large and Y-shaped. Seiun Kamen Machineman has "M" for the titular character, in both his superhero form and his Cool Car-Cool Plane vehicle. "G" is for Super Grover on Sesame Street. As with feature films, in Superman TV adaptations the S-shield always exists before anyone thinks to call him Superman (despite the "S" obviously standing for Superman in the earliest original comics), and the explanations tend to follow recent thinking in the comic books. Lois & Clark followed suit. In this series, the S-shield is only on Clark's outfit in the first place due to a last-minute thought that it "needed something" , an applique of the shield was apparently tucked into the baby blanket they'd found him in, and she correctly assumed it was a family crest. Martha. Your folks'd be proud of you. We sure are. In one scene where Martha is talking to Lois while strangers are in earshot and needs to refer to Superman, she draws an "S" on her chest with her finger. When Lois gets super powers, she calls herself Ultra Woman, and her outfit (again designed by Martha) has UW on the shield-shaped cape clasps ◊. More specifically, Lois's costume has two clasps: the right-hand one has "U" in the shield, and the left-hand one "W", so that someone facing her sees U-W.
Smallville: In the episode where Clark meets Virgil Swann and discovers his Kryptonian heritage, it's made clear the "S" is the Kryptonian symbol for "hope" (see Comic Books above). When Clark finally starts using the shield for a calling card (as The Blur) in later seasons, and in season 9 starts wearing a silver version on a black uniform, it therefore sort of counts as Brought To You By The Letter Hope. When Lois Lane is briefly the superhero "Stiletto", she mentioned wanting to sew an "S" on her chest but thinks it is too tacky. Supergirl: In addition to Supergirl and Superman's traditional symbols, one time, Mr. Mxyzptlk pretended to be a superhero. He wore a replica of Superman's costume, with the "S" replaced with an "M". Betty Suarez of Ugly Betty wears an identical "B" necklace. The members of Goranger all wear belt buckles shaped like a "5" (as in "Go" for five), while each of their helmets are individually numbered from 1 through 5. The four main members of J.A.K.Q. wear belt buckles shaped like a "J", as well as individualized helmets and badges engraved with the first letter of their respective "rank" (Jack, Ace, King and Queen). Big One wears a belt buckle shaped like a "B1" and a helmet with a "1" engraved on it. "BF" is for Battle Fever on the chest of the Battle Fever Robo. The individual members of the team have the first letters of their respective countries/codenames engraved on their belt buckles as well: Battle Japan, Miss America, Battle Kenya, Battle France and Battle Cossack (who represents the Soviet Union). "D" is for Denziman, with the letters on the belts for "I [color]" (i.e. Denzi Red has "IR", Denzi Blue has "IB", ect.). The "I" is actually the left half of the letter "D" that forms the main emblem on their badges. Sun Vulcan has a general "V" design that stands for "Vulcan". The Sand Vulcan jeep is also adorned with the letters "SV" as well. The members of Goggle-V all wear a badge with a "V" symbol (a roman numeral five), as well as belt buckles with "GV" engraved. "D" is for Dynaman on their badges, plus a roman numeral and "D[letter]" for Dyna[color] on their helmets. "CM" is for Changeman on their belt buckles and gloves. "FM" is for Flashman on their belt buckles. Subverted by the "5" in Hikari Sentai Maskman, which doesn't stand for anything despite appearing prominently on the chest of each member (it was an artifact from when the show was going to be titled "The Fiveman"). "LM" is for Liveman on the waist of the Live Robo. Another general costume design resembles "T" for Turboranger. We also have on their belt buckles: GT (for Grand Tourer) on Red, T (for Truck) on Black, J (for Jeep) on Blue, B (for Buggy) on Yellow and W (for Wagon) on Pink. Another team with "V" costume designs can take it as the roman numeral for Fiveman. "Z" is for Zyuranger; not on the Ranger suits but on the backside of the belt buckles (visible on the civilian outfits) and a couple places on the mecha. When it shows up in Mighty Morphin' Power Rangers (Season 1), it can be implied to mean "Zordon". With the exception of the Pteranodon/Pterodactyl, each of the Guardian Beasts/Dinozords bears a stylized initial: Tyrannosaurus has a yellow T on its chest, while the Saber-toothed Tiger wears a capital S and T on either side, the Mammoth does the same with M, and TRIceraToPs carries TRI and TP on the armor covering its treads. "D" is for Dairanger. Its counterpart, Mighty Morphin' Power Rangers Season 2, dropped this but added a villainous version with "Z" for Zedd. King Ranger had 王, the kanji for "king", on the face of his helmet and on his staff. It provides a Bilingual Bonus in Power Rangers Zeo. "C" is for Carranger. (Power Rangers Turbo ignores this completely and it's just a generic logo.) Also (in both shows), "S" is for Signalman and Blue Senturion. "M" is for Megaranger (again, just a generic logo in Power Rangers in Space). This also shows up on the mecha in non-logo forms, though the later ones' "MV" and "MW" (Mega Voyager and Mega Winger) do apply to Power Rangers as those names weren't changed. In addition, "N" is for Negiranger, but this also is ignored in the US as we call them The Psycho Rangers instead. "SPD" is for Special Police Dekaranger or Space Patrol Delta. They also have numbers on their chests, "1" to "5" for the main team and "100" and "VI" (6) for the extra members. One Shot Characters also show up with other numbers: "M" for 1000, which some also take in a roundabout way as 7 (M -> IVI -> VII); "X" for 10 (Dekaranger only); and 0 (SPD only - and appropriately enough for a wannabe). One temporary Ranger, DekaSwan/Cat Ranger, has no blatant number; but the design on her chest can be interpreted as "8", "白" (the kanji for "white" - which resembles 百, the kanji for a "hundred" minus one stroke, making her 99), or a heptagon representing seven. Also in SPD, the Yellow Ranger has a necklace with "Z" for... Z (short for Elizabeth). "M" is for Magiranger and Mystic Force. In the same series, "W" is for Wolzard and Knight Wolf and "S" is for MagiShine and Solaris Knight. AkaRed, the living embodiment of every Red Ranger in history, originally wore a badge engraved with the number "30" during his first appearance in GoGo Sentai Boukenger vs. Super Sentai (which commemorated Sentai's 30th anniversary). This was updated to "35" when AkaRed returned as a semi-recurring character in Kaizoku Sentai Gokaiger (the 35th Super Sentai show). The main Go-Ongers and RPM Rangers also have numbers 1-5 on their chests. There's also a "G" for Go-Onger in various places (including on the chests of the Sixth Rangers in place of a number), but it's another that's stylized enough to serve as a generic logo in RPM. The Shinkengers and Samurai Rangers wear the appropriate Japanese kanji (火 fire, 水 water, 木 wood/forest, 土 earth, 天 sky, and 光 light) on the visors of their helmets. "B" is for Basco in Kaizoku Sentai Gokaiger. The Hikonin Sentai Akibaranger logo is a combination of the letter A for "Akibaranger" and the kanji 非, which means "non-" and is the first character in hikonin ("unofficial"), so it's sort of a bilingual example. "GB" is for Go-Busters and Grid Battleforce, the latter being the organization backing the Rangers in Power Rangers: Beast Morphers. "TQG" is for ToQger. They're also another team with individual numbers 1-6, this time on their chests and helmets. At first glance, the Shuriken Sentai Ninninger logo is a shuriken with lines representing wind around it. But the wind lines make it resemble 忍; meaning "shinobi" or "nin". Power Rangers Ninja Steel, yet again, considers it nothing more than a shuriken. In Kaitou Sentai Lupinranger VS Keisatsu Sentai Patranger, the Lupinrangers have a "V" insignia and the Patrangers have an "S". It's not revealed what they stand for, if anything, though out-of-universe "VS" represents the two rival teams being versus one another. In the same series, "X" is for Patren X and Lupin X, which are both names for the Sixth Ranger depending on which team he allies with. He has the X motif since "X" is used in Versus Titles the same way that "VS" is. "V" is for Major Victory, a season 1 contestant on Who Wants to Be a Superhero? Parodied in Sugarhill Gang's "Rapper's Delight" when Henry "Big Bank Hank" Jackson quips to Lois Lane, "You need a man who's got finesse / and his whole name across his chest." "H" is for Hurricane, former resident superhero of the WWE. "R" is for Rosey, his boy (well, 300-pound Samoan who acts like a boy) sidekick. "R" may have been Rosey's insignia once he graduated from sidekickery, but first he was a "Super Hero In Training" (S.H.I.T.). Rosey's real-life brother, Roman Reigns, later took to wearing a mirrored "R" emblem on his vest, evoking his "superman" status on the roster. Reigns' former partners in The Shield also adopted emblems of their initials: Seth Rollins on his belt buckle, and Dean Ambrose on his entrance gear. Scott Steiner used the Superman S  actually the full Superman logo, until the expected legal action forced a change to an S in an ellipse. Chris Hero parodied this by wearing the same logo with the "S" crossed out. In another non-superheroic example, during his WWE tenure, the number "13" was for Tazz. According to Tazz, the "13" represented the bad luck his opponents must have had to have drawn him as their opponent for the evening. Some of Kurt Angle's singlets featured an "A" inside a Superman-esque shield, obviously standing for Angle. In his typical smartass fashion, The Rock came up with his own vulgar ideas of what the "A" stood for. T on the forehead of CMLL's Talismán, naturally. Sassy Stephie wears an "S" and a backwards "S" to make a valentine symbol on her chest. AJ Styles (The Phenomenal One) has a wide assortment of gear with emblems of either "AJ" or "P1." Ivelisse Vélez has a set of kick pads with "PR" on them. Kevin Owens, to capitalize on the abbreviation for "knockout." Yu-Gi-Oh! : H is for Elemental Hero, but D is for Destiny Hero and N is for Neo-Spacian (although just to be confusing, one Elemental Hero works with all Neo-Spacians). Not to mention that each of the letters of the word 'Hero' has its own card. Since one of them gets any Elemental Hero from the deck to your hand, and another Special Summons an Elemental Hero from the Graveyard, this could be a literal case of Brought To You By The Letter S (or in this case, E/O). The Ultra Marines logo in Warhammer 40,000 is a stylized U that looks more like an upside down Greek letter Omega. Akuma from Street Fighter has a winpose where the kanji for "heavenly sky" shines on his back, usually done after defeating an opponent with his Raging Demon super. It's pronounced "ten", by the way. "M" is for Mario, "L" is for Luigi, "W" is for Wario, and logically enough, "Γ" (capital Gamma) is for Waluigi. All these symbols appear on characters' hats, rather than on their chests. City of Heroes' ridiculously extensive costume creator gives you a choice of the entire uppercase Latin alphabet and figures 09. After six months of subscription, players get to access all letters of the Greek alphabet, uppercase and lowercase. Although ironically for a superhero game, not many players follow this trope. Klavier Gavin (Kyouya Garyuu in the Japanese version) in Apollo Justice: Ace Attorney has a G pendant. DK! Donkey Kong! On his tie, uniquely enough, but it's also his only piece of clothing. In Mega Man Zero, Copy-X wears a jacket that crosses over his chest like an X (as do his four Guardians) and Cyber-Elf X looks like a ball with a rainbow X around it, foreshadowing his identity. In Mega Man X 8, X's earpieces have X-shaped lights and his new basic form in Command Mission has a stylized white X on his chest. Zero in the X series also has the letter "Z" on his left shoulder plate. While it isn't shown on his in-game sprite, Gravity Man from Mega Man 5 has a letter "G" on his belt. Marisa Kirisame's design in the 12th Touhou game, Undefined Fantastic Object, gives her an apron with a large "M" on it. Hina Kagiyama, a curse/misfortune goddess, has a stylized kanji 厄 (yaku) on her dress, meaning "misfortune". In Space Channel 5 Part 2, "P" stands for Purge. Twilight Heroes features the "letter shirt" for its superheroes, which can be customized to show any capitalized letter in the English alphabet. Picky Minch from EarthBound wears an M on his shirt, for "Minch". His clay model artwork shows a P on the shirt instead, probably for "Picky". "K" is for Konami Man. Ash, Big Bad of Galerians: Ash, sports an "A" on his chest. The player character of Punch-Out!! spinoff Arm Wrestling has a V on his shirt; since he's nameless outside the initials you give him, it's unknown what it might stand for. Dr. Neo Cortex of Crash Bandicoot has a giant N on his forehead. His niece Nina has a lowercase "n" on hers. It's evidently a tradition from the Academy of Evil they attended, as the headmistress Madam Amberly in Crash Twinsanity has a giant A on her head. The big red R for Rocket of Team Rocket, general bad guys of Pokémon Red and Blue and Pokémon Gold and Silver. Of course, there's also Teams Magma, Aqua, Galactic, Plasma, Flare, and Skull - these six use a font style that's a bit more original, but there's still the 'M', 'A', 'G', 'P', 'F', and 'S'. "M" is for Strong Mad. Coach Z wears a medallion with a stylized letter "Z" on it. "TH" is for Bubs' alter ego, the Thnikkaman. Homsar wears a shirt bearing his name. In his Slash costume in "3 Times Halloween Funjob", it said "Slash" instead. X-Ray & Vav: X-Ray has an "X" made of green lightning bolts and Vav has a "V" with a hat and colored to resemble the British Flag. Before getting their spandex costumes, they just taped a piece of paper with the insignia printed on it to their shirt. DSBT InsaniT: Knobs has 'U.S.S.' written on him. Its...not clear what that means. Mister Mighty, of Everyday Heroes, of course wears a gold "M" in an oval. His teammate, Dot Dash, wears a dot-and-dash on her chest; Morse code for the letter "A". This is one of the most convoluted Punny Name references ever: The dot is for her first name Dorothea, the dash is for her super-speed, the "A" is for her maiden name of Axel, and Morse code for her married name of Morse. In The Inexplicable Adventures of Bob!, after Bob very briefly becomes a Super Hero and then loses his powers, he says his one real regret is that he used a permanent laundry marker to make the "B" logo on his shirt. Evan from The Wotch always wears a shirt with a capital "E" on it. Lilly wears a dress with a lil' 'e' on it instead. Homestuck: When Kanaya imagines a troll version of Rose, she wears a dress with her initials, RL . The actual trolls themselves are this as well, in a strange and roundabout way. The symbols the trolls wear on their shirts are twelve out of thousands which just so happen to coincide with our own zodiac symbols. Each color acknowledged by the hemospectrum has a library of hundreds of symbols associated with it; every troll is assigned one after they pupate, and they must wear it somewhere upon their person their entire lives. This symbol acts as a single-character signature for them and they may, in fact, sign documents with it. When Redd's titular character gets her own official outfit, the chest features a big 'VR' (for 'Vicky Redd'). Many of the companies in Consolers wear shirts featuring the first letter of their company name/logo, such as "N" for Nintendo, "S" for Sega, and "S-E" for Square Enix. In the superhero arc of Arthur, King of Time and Space, Arthur Pendragon's identity as Kingman has a "K" on his chest. 'P' for Phase, in "Boston Brawl II" of the Whateley Universe. Since Phase is a density changer like the Vision, the 'P' starts out dense at the top and fades away at the bottom. Phase hates it. 'C' is for C the speed-of-light-octogenarian in Legion of Nothing. 'J' for Jock, a super-athlete with heightened reflexes from the Global Guardians PBEM Universe. 'E' for Embrace, a stretchable supervillain. Also for Echo, a superhero with ultrasonic powers. There's even one villain with a number: '8' for Eight-Ball. 'S' for Simon Lane of the Yogscast in real life: He once wore a distinctive blue Superman hoody. For a time in 2011, Simon's character Honeydew in the Yogscast Minecraft Series had a metallic S symbol over his chest, which Simon claimed was for Simon AND Superman. In Neopets, most Aishas have collars with the letter 'A' on them. The Darigan-colored one has a 'D' instead, and the Snot-'colored' one has an 'S'. Justice Squad: Being a semi-satire of superheroes, it's quite prevalent on the team members. "A" is for Alvin, as in Alvin and the Chipmunks. "R" is for Richie Rich, at least as Hanna-Barbera animated him. Also Ralphie from The Magic School Bus. "M" is for Marvin White, the aspiring superhero in the first season of Superfriends. "J" and "Z" are for Jayna and Zan, the Wonder Twins. In the classic Bugs Bunny short "Super-Rabbit", "S" stands for Super too. All Canadians on South Park have either the first letter of their name (T for Terrence, P for Phillip, etc.) or their position (f for fans at a football game) on their shirt. I.R. Baboon from I Am Weasel has an upside-down "IR" scribbled on his shirt. After fiddling around with casual outfits for José Carioca's comic book series, they eventually settled on a T-Shirt with a "Z" on it, for "Zé". "8" is for Manic 8-Ball, a one-shot villain from The Venture Bros.
"DP" is for Danny Phantom (the "P" is inside the "D"). "H" (inside a male symbol) is for Captain Hero of Drawn Together. It's actually his real name, though (Leslie Hero). "A?" is for a Canadian superhero appearing extremely briefly in an episode of Eek! The Cat. "A" is for Atom Ant. "C" is for Coil Man of the Impossibles and for Curly Howard of the Robonic Stooges. "CR" is for Captain Rescue . "DM" is for Danger Mouse. "F" is for Fluid Man of the Impossibles, for his namesake of the Super Globetrotters, for Frankenstein Jr. and for Blue Falcon. "G" is for Gizmo Man of the Super Globetrotters, and Gizmoduck; Inspector Gadget also has a few of these, most notably on his Gadget-mobile. "L" is for Larry Fine of the The Robonic Stooges (and "M" is for Moe and "C" is for Curly, of course(. "M" is for Multiple Man of the Impossibles, for his namesake of the Super Globetrotters and for Moe Howard of the Robonic Stooges. "Q" was (briefly) for Quiverwing Quack; Darkwing Duck's daughter really wants in on the family business. "SD" is for Scooby-Doo (on his engraved dog-tag). "SG" for Super Goof as he appeared on House of Mouse and in the comics. "N" is for Captain N: The Game Master. It's actually a Varsity letter on a Letterman jacket, so In-Universe, it's more of a convenience that his school's name and the company that produced his favored console (and the fact that Videoland is populated pretty exclusively by characters from or inspired by that company's games) share an initial letter. "KP" is for Kim Possible. She doesn't wear the insignia, but it does appear on the screen of her Kimmunicator. "M" is for the so-called Mysterious Mare Do Well of the alike-titled My Little Pony: Friendship Is Magic episode, whose full-body costume includes a cloak clasp bearing the letter. "B" is for Burners, as of Motorcity. The Burners wear a stylized B somewhere on their attire, save for Julie, to hide it from her father, Abraham Kane. In Teenage Mutant Ninja Turtles (the 1987-1996), each Turtle has a belt buckle with his initial on it. When Rerp gains superpowers and becomes Holden's arch-nemesis in The Flamin' Thongs, he dons a costume with a big 'R' on the front of it. In The Family-Ness, Angus has a "T" on his shirt (most likely short for his last name, MacTout). Anne Boleyn famously had a necklace with the letter B. Also one with an AB monogram. And her daughter Elizabeth is portrayed wearing an A pendant that she must have inherited from her mother. Many sports teams use this, particularly Major League Baseball. As of the 2014 season, only 2 teams do not have letters on their home or away caps, those being the Toronto Blue Jays and the Baltimore Orioles. The Orioles use letters on caps they wear with their alternate jerseys, while the Blue Jays did formerly use letters on their caps at one point in their history. The Minnesota Twins sport "TC" on their caps, standing for "Twin Cities." In sports with team captains, these will frequently be designated by a stylized letter C on the upper left or right of the front of the jersey. Alternate captains (typically used in ice hockey) will have an A.